It is believed that Parvati (Shiva’s wife) performed penance to beget Ganesha at this point. Girija’s (Parvati’s) Atmaj (son) is Girijatmaj. This temple stands amidst a cave complex of 18 caves of Buddhist origin. 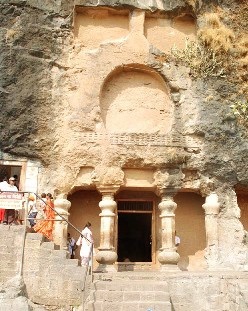 This temple is the 8th cave. These are called Ganesh-leni as well. The temple is carved out of a single stone hill, which has 307 steps. The temple features a wide hall with no supporting pillars. The temple hall is 53feet long, 51feet wide and 7feet in height. The idol faces north with its trunk to the left, and has to be worshipped from the rear of the temple. The temple faces south. 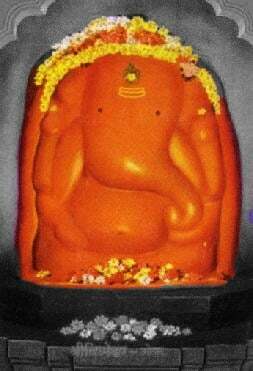 This idol seems to be little different from the rest of the Ashtavinayak idols in a sense that it appears to be not very well designed or carved like the other idols. This idol can be worshipped by anyone. There is no electric bulb in the temple. The temple is constructed such that during the day it is always lighted up by the sun-rays! 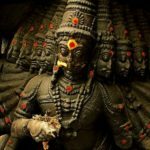 The history encompassing this idol states that Vighnasur, a demon was created by the King of Gods, Indra to destroy the prayer organized by King Abhinandan. However, the demon went a step further and destroyed all vedic, religious acts and to answer the people’s prayers for protection, Ganesh defeated him. The story goes on to say that on being conquered, the demon begged and pleaded with Ganesha to show a mercy. Ganesha then granted in his plea, but on the condition that demon should not go to the place where Ganesha worshipping is going on. In return the demon asked a favour that his name should be taken before Ganesha’s name, thus the name of Ganesha became Vighnahar or Vighneshwar (Vighna in Sanskrit means a sudden interruption in the ongoing work due to some unforeseen, unwarranted event or cause). 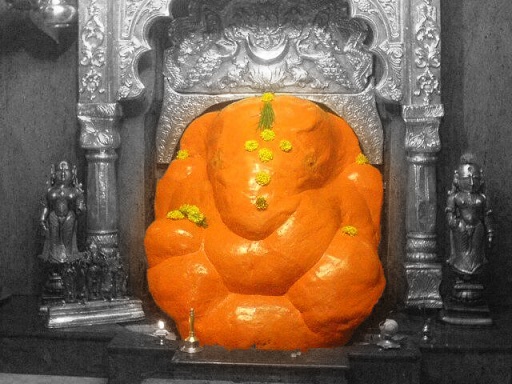 The Ganesha here is called Shri Vighneshwar Vinayak. The temple faces east and is surrounded by a thick stone wall. One can walk on the wall. The main hall of the temple is 20feet long and the inner hall is 10feet long. This idol, facing the east, has its trunk towards the left and rubies in its eyes. There is a diamond on the forehead and some jewel in the navel. Idols of Riddhi and Siddhi are placed on the two sides of the Ganesha idol. The temple top is Golden and is possibly built by Chimaji Appa after defeating the Portuguese rulers of Vasai and Sashti. The temple is probably built around 1785AD. Shiva is believed to have worshipped Ganesha before fighting the demon Tripurasura here. The temple was built by Shiva where he worshipped Ganesha, and the town he set up was called Manipur which is now known as Ranjangaon. The idol faces the east, is seated in a cross-legged position with a broad forehead, with its trunk pointing to the left. 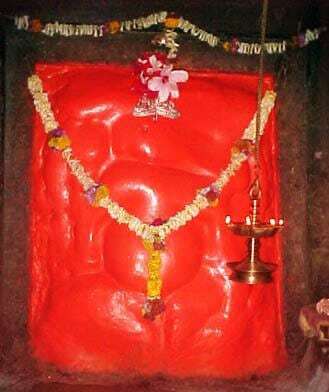 It is said that the original idol is hidden in the basement, having 10 trunks and 20 hands and is called Mahotkat, however, the temple authorities deny existence of any such idol. Constructed so that the rays of the sun fall directly on the idol (during the Southward movement of the sun), the temple bears a distinct resemblance to the architecture reminiscent of the 9th and 10th Centuries and faces the east. Shrimant Madhavrao Peshwa used to visit this temple very often and built the stone sanctum around the idol and in 1790AD Mr. Anyaba Dev was authorised to worship the idol. Ranjangaoncha Mahaganapati is considered to be one of the Ashta Vinayak shrines of Maharashtra, celebrating eight instances of legends related to Ganesha. Legend has it that when a sage had once sneezed he gave out a child; since being with the sage the child learnt many good stuff about lord ganesha, however had inherited many evil thoughts within; when he grew he developed in to a demon by name Tripurasura; thereafter he prayed to Lord Shiva and got three powerful citadels (the evil Tripuram forts) of Gold, Silver and Bronze with a boon of invincibility until all the three are in linear; with the boon to his side he caused suffering to all beings in the heavens and on earth. Upon hearing the fervent appeals of the Gods, Shiva intervened, and realized that he could not defeat the demon. 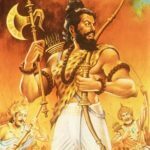 It was upon hearing Narada Muni’s advice that Shiva saluted Ganesha and then shot a single arrow that pierced through the citadels, bringing an end to the demon. Shiva, the slayer of the Tripura citadels is enshrined at Bhimashankaram nearby. A variation of this legend is commonly known in South India. Ganesha is said to have caused the axle in Shiva’s chariot to break, as the latter headed to battle the demon without saluting Ganesha before he set out. Upon realizing his act of omission, Shiva saluted his son Ganesha, and then proceeded victoriously to a short battle against the powerful demon. Mahaganapati is portrayed, seated on a lotus, flanked by his consorts Siddhi and Ridhi. The temple dates back to the period of Peshwa Madhav Rao. The temple was erected during the rule of the Peshwas. 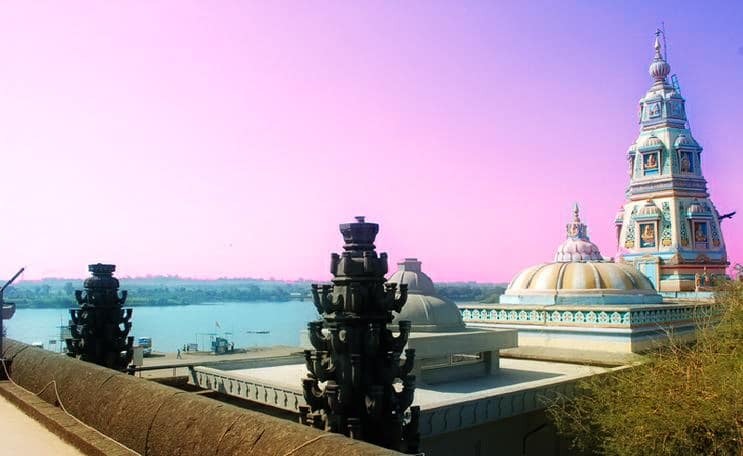 Peshwa Madhavrao had constructed the Garbhagriha, the sanctum to house the swayambhoo statue. The temple faces east. It has an imposing main gate which is guarded by two statues of Jay and Vijay. The temple is designed in such away that during Dakshinayan[ the apparent movement of the sun to the south] the rays of the sun fall directly on the deity. The deity is seated and flanked on both sides by Riddhi and Siddhi. The trunk of the deity turns to the left. There is a local belief that the real statue of Mahaganpati is hidden in some vault and this statue has ten trunks and twenty arms. But there is nothing to substantiate this belief. Credits: To the original photos and the photographers!